A couple years ago I planted a huge bag of Hyacinth flowers in my front yard next to a bench. Every spring when I walk out there to enjoy a morning cup of coffee I am awe struck at my beautiful Hyacinth flowers and how wonderful they smell. They are my favorite! I noticed them beginning to pop out of the ground this past week so I am celebrating the beginning of spring time with these beautiful paper Hyacinth flowers. 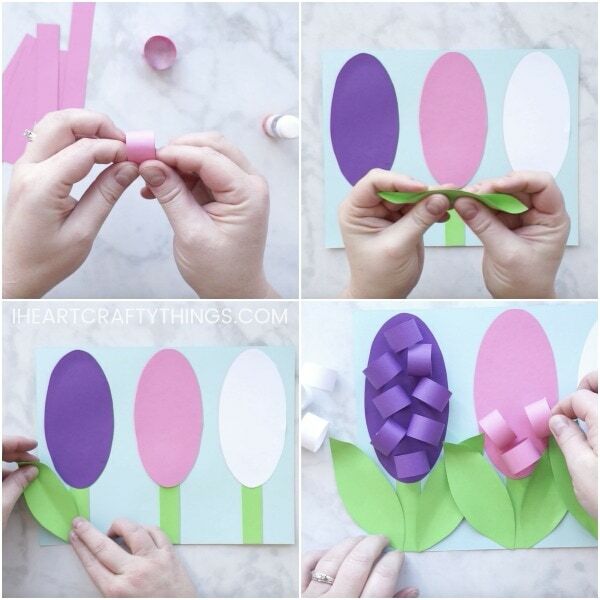 They go along perfectly with our 3D Tulips and the spring tree craft we shared earlier this week. Hyacinth Flower Template <—–Download at the bottom of this post! 1. Download the Hyacinth flower template at the bottom of this post and print it out on colored cardstock. 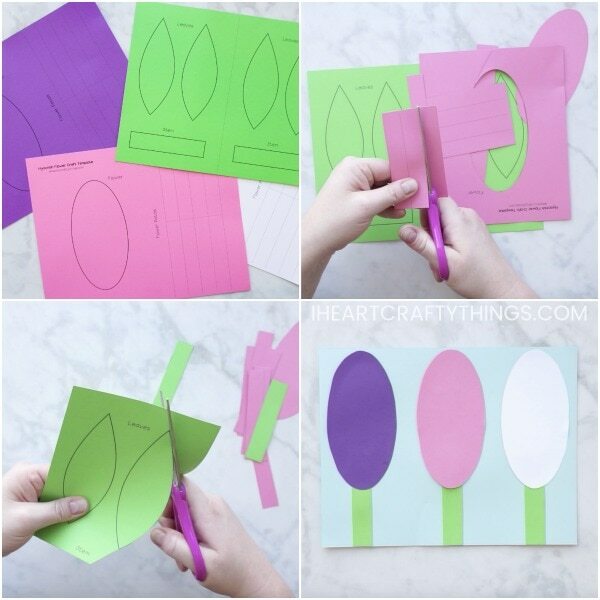 Use green cardstock for the leaves and stem and either purple, pink or white for the flower page. Cut out the pieces of the template. 2. Prepare the flower petals. Use a glue stick to add some glue at the end of the flower petal rectangle. Then fold the rectangle into a circle and glue the opposite ends together. Continue making all of the flower petals into circles. 3. 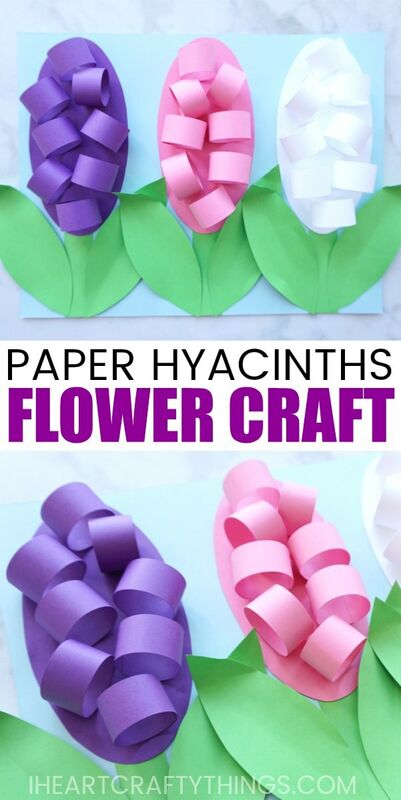 Glue your Hyacinth flower stems at the bottom of your blue cardstock paper. Then glue the oval flower bases on top of the stems. 4. Bend a leaf in half and curl down the top of the leaf slightly to add some dimension to it. Add some glue to the back of the petal and glue it onto the side of one of your hyacinth flower. Repeat this step for all of the leaves and glue them onto the sides of the flowers. 5. Add a dot of Tacky Glue at the bottom of your flower petals and glue them onto your Hyacinth flowers. 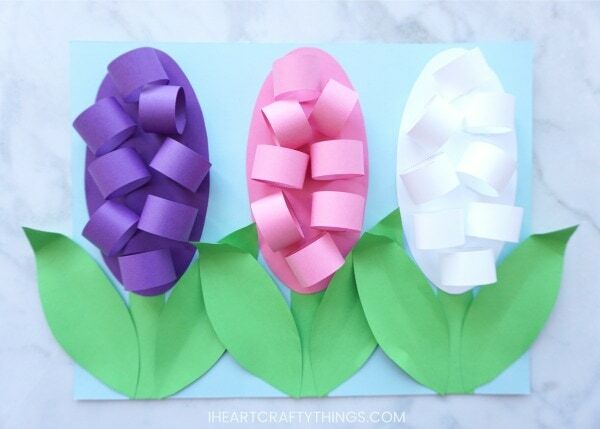 We added three paper Hyacinth flowers onto our paper but you can choose to add however many you’d like. 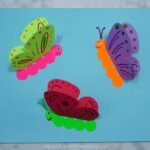 Looking for more fun spring flower crafts? 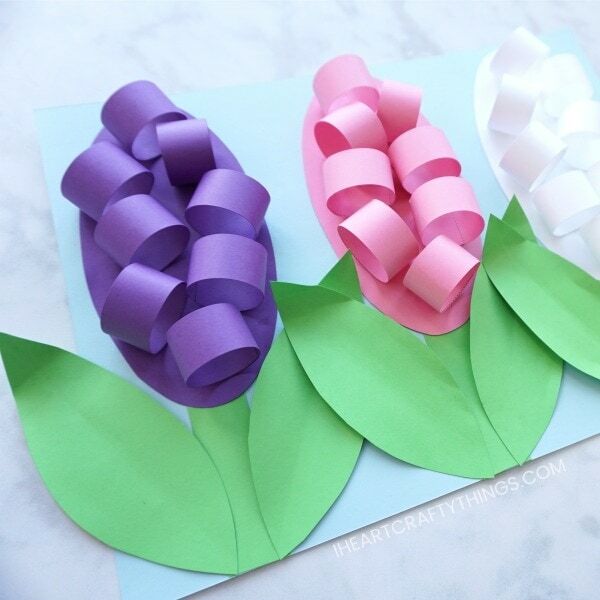 These paper tulips are another fun 3D favorite for spring and they are gorgeous! 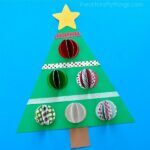 Use this same circle technique to create a unique and colorful spring tree craft. 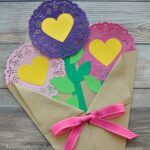 If you love making paper flower crafts, you’ll love this collection of beautiful 3D Flower Crafts. Enter your email address to join my weekly newsletter and get FREE access to the Hyacinth Craft template! After you click 'enter', a pop-up with the template download will appear. Despite entering my email address, I was not able to download patterns to print, specifically the hyacinth mothers day card. Disappointed. Hi Beth! I apologize you had trouble with the download. It should have automatically downloaded as soon as you hit submit. I have tested the download myself with no issues and have had over 1,000 people download in the last few days. I will email the printable to you. Please know if you ever have any issues in the future with any of my downloads I check my email daily so if you email me I can help make sure you get it. My email is iheartcraftythings@yahoo.com.